Pomme frites, French fries, hot chips, potato chips, fries, or French-fried potatoes are just some of the many names for the delicious deep-fried batons of potato that have come to work their way into the hearts and mouths of potato-faring folk the world over. To me, these two foods go wonderfully together and I often order this combination when I am at French restaurants. You can dip the fries in the mussel broth and soak up the delicious flavor or just eat them straight up! Cook chips as per packet instructions. Meanwhile, heat oil in large fry pan over a high heat, reduce heat to medium and add garlic. Fry, stirring for 1 minute or until fragrant. Add tomato paste and sugar and fry, stirring for 1 minute. Add tinned tomatoes and water, and season with salt and pepper to taste. Add mussels, ensuring they are evenly distributed in the sauce, cover and allow to cook for 8-12 minutes or until mixture has thickened and mussels have opened. Add thickened cream and stir to mix well and allow to simmer over a low heat. 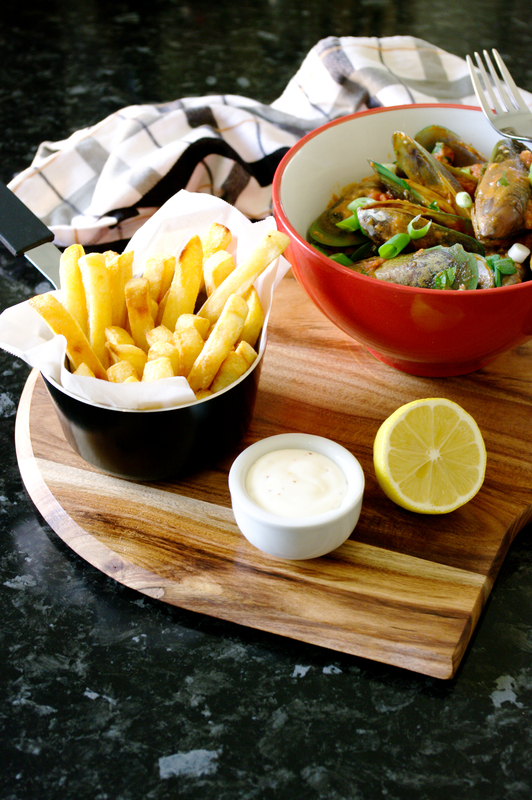 Remove chips from oven and place on to a serving plate, spoon carefully mussels into four serving bowls, sprinkle with chopped chives and serve with aioli and lemon wedges. I adore your wordpress theme, wherever did you download it through?